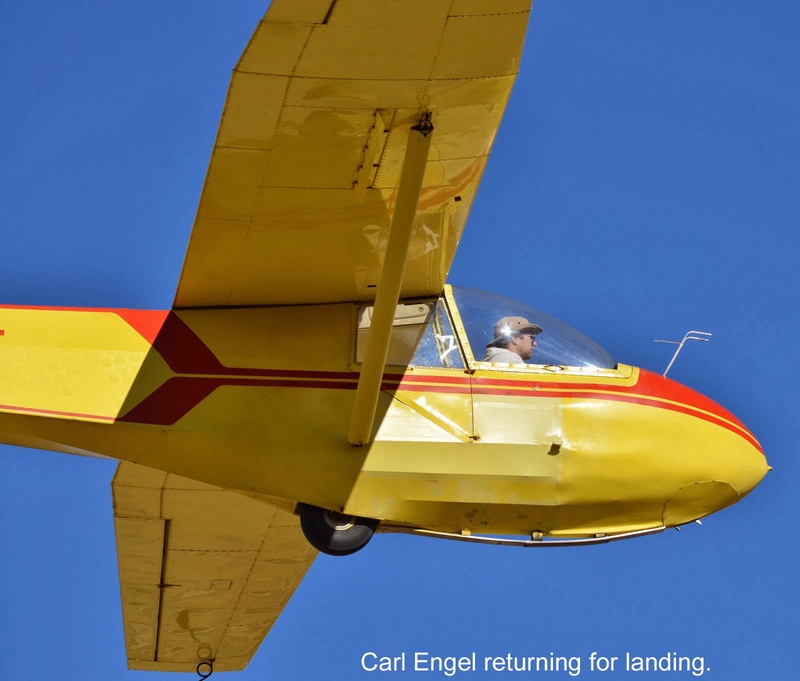 Altitudes: As high as the towplane got you. Several of Saturday's participants sent out emails to all members of the club. I have simply brought them all together into one blog, edited a little to make them flow, then posted them here--Jim. There were a handful of us flying on Saturday. It was glassy smooth, and foggy over toward the Paso Robles area. I released over Tar and trimmed up for some slow flight in the zero sink that was there. Absolutely smooth, and quiet. I think I was doing just under 50. The zero sink gave way to 2-400fpm down, and as I headed back for Avenal I ran into a tiny little 200fpm thermal near the old house. I was able to loiter in that thermal for about 15 minutes and basically just hold my altitude. It too diminished and I headed back in. 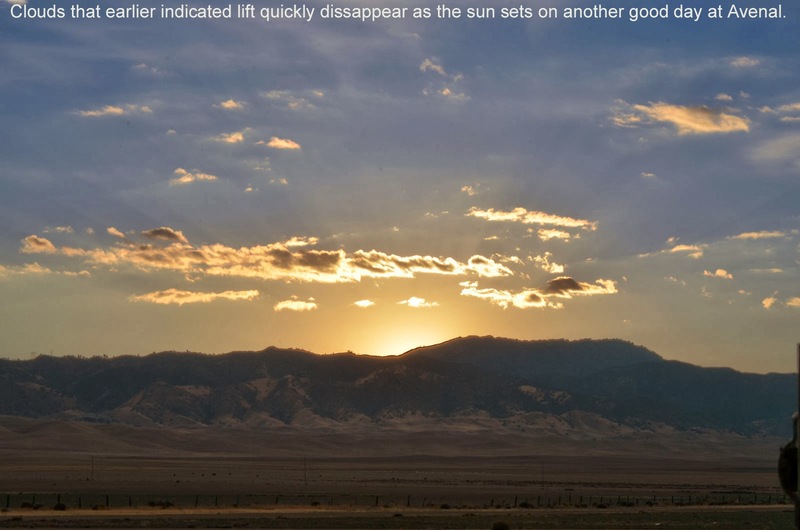 As Jan reported, those of us that flew on Saturday experienced little, if any, lift and lots of haze. Nevertheless, it was a most enjoyable day at Avenal. Those of us that are working toward a license were able to get in as many training flights as we wanted. In part, this was due to the limited number of folks flying. But in larger measure, it was due to the efficient manner in which the launches and retrievals were organized and the quick turnaround time afforded by the Pawnee towplane. As usual, the best part of being at Avenal (aside from the moment we pull the red handle) was the sense of camaraderie, support, and helpfulness that seems to define the sport of soaring at Avenal. 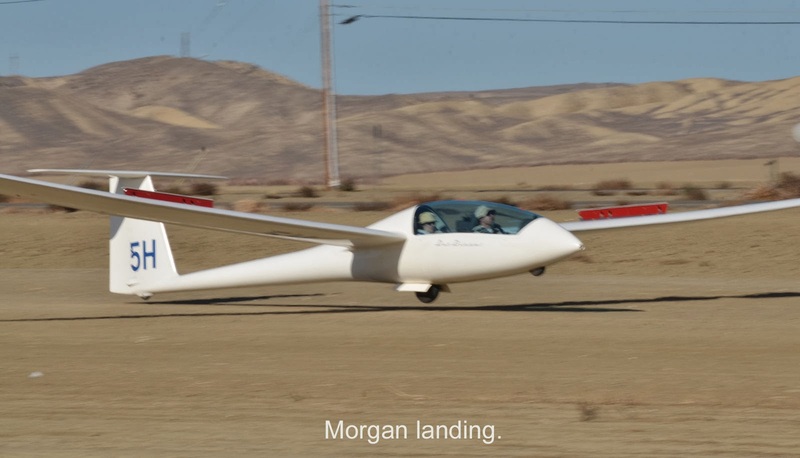 So, thanks, Morgan, for arranging the tows, to Bill for flying them, and to Dan and Alex for sharing their extensive experience and wisdom with all of us. The air was still, the views were awesome. I took two 3k tows. Well worth it. One note, it appears that we had burst pipes on the irrigation system--we had a mudpit from the clubhouse extending about 80 feet onto the runway. The water was off when I got there. I opened the valve at the meter and isolated the irrigation back to the in-ground gate valve. We left the water in service to the clubhouse. The irrigation and overhead spray will need work. Nice video Jan! 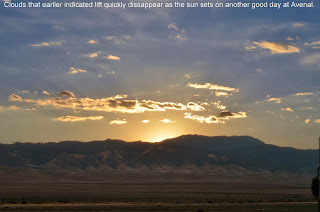 From the ground, we saw a big red-tailed hawk soaring in the same area where you found the thermal. Looked like he or she was maybe 1500 ft. AGL. It was making these long flat straight in approaches to landings in the scrubby tree just off the approach end of runway 31. It's the tree Morgan cut the top off of a while back, but it's now growing back. Those were great comments Mike. It was a fun day even though I never actually flew, it was great hanging out with everybody. 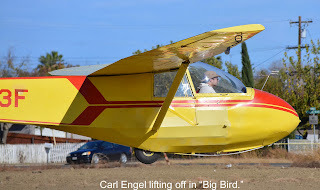 I am deep in prep for my Single Engine Land checkride and couldn't make it out. 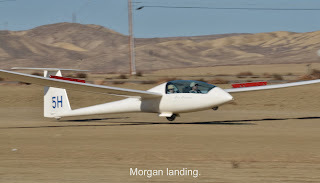 Being a glider pilot before going for my power add-on has been a huge advantage, but I am having to fly a number of hours just to have the hours logged doing certain activities to satisfy all the applicable FARs. Too bad, because I also need to take 3 flights with Harold and Alex to get my Commercial glider checkride endorsement. 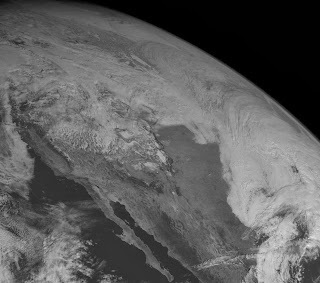 The haze pouring over into the coastal valleys from the Central Valley was really thick and a sharp inversion at around 3500 was just about everywhere. I am amazed that Jan found even 15 minutes of soarable air in that thick stuff. Great to hear that you guys were running fun and efficient. As I drove over the hill separating Avenal from the main San Joaquin Valley, one look at the low haze layer in the Avenal valley told me I not going to be soaring today, just gliding. I took 3 tows to 3000'. On the first ascent there were some bumps that made me think I might be able to find some lift, but by 1800' MSL it was smooth as glass. Spent most of my time practicing 720° steep turns, or more often, just the entry to and exit from the steep turn, and maybe a 360°. In my power plane world I have never come close to using every bit of control travel to start and stop a steep turn. Neither have I in a power plane ever had to use any noticeable opposite aileron to keep the steep turn from getting steeper. Of course, at twice the speed the turn radius is 4 times greater, so the velocity difference between the inside wing and the outside is not nearly as dramatic. At 3800' I could see the peaks around Gorman and Tehachapi and the snow on the Sierras. Picked a distant peak to sight on for a 720° turn, but with the altitude lost during the turn, the landmark disappeared into the haze. Picked a much closer peak for the next 720°, and even it looked much different though the thickening haze as I completed the turn. Coming back down to 1800' MSL the sink rate almost went to zero, most of the time, with an occasional small bubble of weak lift. No complaints about lack of lift--it is mid-December, look at the rest of the country. Morgan and Julie return from their excursion to the hills. With SE flow, we were forced to use 13 for departures and landings. It's amazing how much more efficient we are when we can launch 31 and land on 07 with the towplane. 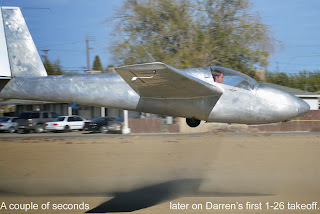 Darren Council takes his first flight in a 1-26. 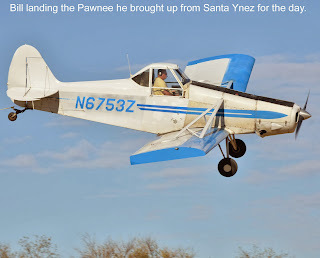 The Pawnee doesn't even know it is there and the climb looks more like a winch launch than an aero-tow.